Only forty-three years after the settlement of the US-British border dispute, which established the United States’ northern border at the 49th parallel, in the same year as Washington became the 42nd state, Owen B. Williams founded the O.B. Williams Company in Fairhaven, WA. 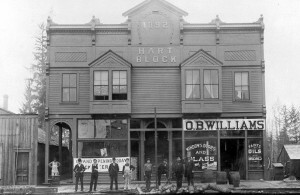 In 1902, Williams moved the company to Seattle where the business flourished during a building boom lasting from 1900 to 1910. By 1911 he had constructed and moved into a 40,000 square foot store and factory on First Avenue South, adjacent to the company’s current location. After Williams’ death, the company was sold to Joe Burke and Ray McCoy and incorporated in 1942. Burke soon sold his interest to McCoy and several members of the McCoy family remained actively involved in the business well into the 21st century. In 2000, a majority interest was sold to David Wick, a long time employee and by 2016 Wick acquired 100% ownership of the historic company. Over the years O.B. Williams Company’s focus has changed from large scale manufacturing and distribution of windows and doors to custom manufacturing of superb custom architectural woodwork. The company has provided doors, paneling, cabinets and millwork for all manner of commercial buildings, hotels and even the last great concert hall to be built in the 20th century, Benaroya Hall. In recent years, O.B. Williams Company has excelled at providing custom woodwork of all descriptions for incorporation into high end residences throughout the US.